The Cumberland & Dumfriesshire Farmers Mart P.L.C. 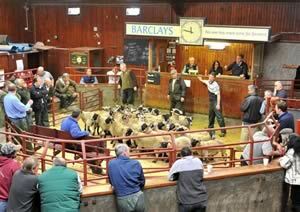 had forward 52 prime cattle, 31 over thirty month cattle, 380 prime lambs, 3,436 prime hoggs and 3,545 cast ewes & rams at their weekly sale at Longtown on Thursday 27th May, 2010. Clean cattle saw heavyweights cheaper and lightweights short of requirements. Limousin heifers from Hallburn sold to 183.5p, 178.5p, 174.5p and 170.5p. Limousin bullocks sold to 165.5p Dashwellgreen and 162.5p Houghton House. The 31 OTM cattle again met a brisk trade for a good show of grazing cows with 7 active buyers in attendance. Top price of 133.5p for a Limousin bullock from D. & Y. Wilson, The Plumpe, others 121.5p Fenton, 113.5p The Plumpe. British Blue heifers to 115.5p Horsegills, 105.5p Nether Albie. Limousin cows to 119.5p Dinley, 106.5p Moss Side, 105.5p Nether Albie, 100.5p Fellend; Charolais 115.5p Blindhillbush; British Blue 113.5p Laalsteins, 111.5p, 104.5p Mossband Hall; Simmental 102.5p Mossband Hall; Friesian 96.5p Evertown, 75.5p Peterscrook, 74.5p Halltown. A larger show of 380 new season lambs saw trade sharper on the week, coinciding with greater demand for them up and down the country. Numbers short of requirements and up to 43 kilo lambs being sufficient weight. Top price of 233p per kilo for Texels from W. Tinning, Mossband House and to £118.50 per head for Suffolks from Mr Johnston, Kimmeter Green, others £103 Land Farm, £98.50 Kimmeter Green; Texel £105.50 Harelawhill, £104.50 Mossband House, £100.20 Summerhill; Oxford £90.80 Guards; Charollais £89.80 Rottington Hall and Kimmeter Green; Greyface £86.80 Harelawhill, £75.80 Newington. A smaller show of 3,436 prime hoggs was forward, selling to the usual full ring of buyers. Trade was easier on the week with the sale levelling at 170.3p per kilo, again with many consignors having an end of season clearout. Well fleshed hoggs were still readily wanted and short of buyers requirements. Top price of 214p per kilo for Texels from Messrs Bell, Greenknowe and to £100 per head for Texels from Riverside, others £98.50 Greenknowe and Upper Mains; Beltex £97.80 Hillside; Charollais £97.50 Dashwellgreen; Suffolk £95.50 Riverside, £89.50 Alton; Greyface £89.50 Riverside, £87.50 Barnakill and Shawhills; Hill Cheviot £87.50 Stackbraes, £79.80 Nether Stenries, £79.20 Dashwellgreen; Blackface £86.50 Shawhills, £82.20 Meggethead; Zwartbles £82.50 Golden Lane; Easycare £79.50 Golden Lane; North Country Cheviot £78.50 Shooters Bottom and Whitchester, £75.80 Harelawhole; Jacob £69.80 Plumpe; Swaledale £61.50 Kelmore Hills, £60 Golden Lane; Shetland £53.80 Auchreamie. The 723 lightweight hoggs sold to £62.80 for Cheviots from Shawhills, £58.50 Mid Murthat; Texel £60.80 Allerby Hall, £58.80 Shooters Bottom; North Country Cheviot £57.80 Allerby Hall; Blackface £55 Dunjop, £54.20 Stonehouse; Shetland £54.50 Stackbraes; Swaledale £44.80 Stackbraes. A slightly larger show of 3,545 cast ewes and rams saw trade slightly easier on the week, however all classes sold well. Top price of £158.50 for Suffolk tups from Newbiggin and for Bleu d’Maine from Severs, other Suffolks £153.50 Roadside; Texel £153.50 Skinett, £148.50 Newbiggin; Hill Cheviot £130.50 Hill Crest, £90.50 Carlenrigg; Oxford £128.50 Guards; Dorset £128.50 Ackron, £123.50 Severs; Zwartbles £112.50 Overton Bush; North Country Cheviot £110.50 Whitchesters; Leicester £110.50 Overton Bush, £108.50 Highside; Charollais £99.50 Rashee, £83.50 Road Side; Lleyn £93.50 Road Side; Wensleydale £92.50 Rashee; Beltex £82.50 Sockbridge Hall; Blackface £68.50 Bowanhill, £57.50 Sockbridge Hall. Heavy ewes to £143.50 for Suffolks from Newbiggin, £130.50 East Cliff; Texel £122.50 Greenknowe, £118.50 Rashee; Charollais £120.50 Road Side, £119.50 Rashee; Beltex £116.50 Alton, £98.50 Coytre; Leicester £116.50 Harwood House, £94.50 Ty Croes; Bleu d’Maine £112.50 Golden Lane, £106.50 Road Side; North Country Cheviot £98.50 Oldfield, £94.50 Alton; Rouge £97.50 Coytre, £96.50 Severs; Ryeland £95.50 Severs; Greyface £89.50, £85.50 Whinfield, £79.50 Golden Lane; Cheviot Mule £86.50 Gill, £67.50 Bloch; Half Bred £76.50 Burnfoot on Esk, £74.50 Sockbridge Hall; Dorset £66.50 Castle Nook. Hill ewes to £76.50 for Cheviots from Harwood House, £74.50 Bylbster, £73.50 Harwood House; Blackface £66.50 East Farm and Overton Bush, £64.50 Golden Lane, £63.50 Craighousesteads; Lleyn £62.50 Crawfordjohn Mill and Blackhaugh; Swaledale £57.50 Longrow, £55.50 Bayldon and Broomhills; Jacob £49.50 Golden Lane; Herdwick £38.50 Nettling Flatt.